Today South Beach, Miami FL is no longer known as a place where you go out to see your friends, but a place to go with your friends to see and be seen, where you’re not fixated on the persons at your dining table, but at who may walk in at any moment. However, before it become such a Hollywood-oriented mecca, how did it go from a district of decaying buildings and drug dealers in the 1970s to a place desirable by the most creative in the industry, the host for one of the largest art festivals in the world, Art Basel? As with so many of these stories, it started with an extraordinary person. In 1979, a woman named Barbara Capitman made it a personal mission to preserve the deteriorating art deco buildings as nationally historic structures, and succeeded. Once they were officially recognized as treasures, artists began painting them in the brilliant colors you see today, inhabiting many of the spaces, followed by visionary developers like Tony Goldman who saw the potential in transforming them into truly desirable retail and entertainment destinations and homes. 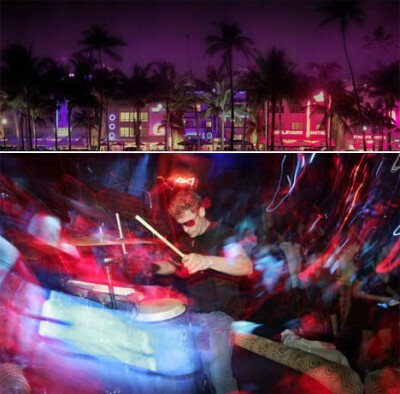 Says Goldman, “On Ocean Drive, the vision was a promenade for cafe life. Those of us who were working on it were very clear we had to keep The Gap out. This couldn’t be any old street anywhere in the country.” Pretty much sums up its path to desirability by the cool and creative right there. The district became such an artistic haven that celebrity photographers insisted having their shoots there, followed by the celebrities, followed by much of the current population described in the very first sentence. At least it’s still photogenic. Read more about its history here in the Miami Herald.